ilvs strauss brings her critically-acclaimed theatrical wit and imagination to a work investigating text based movement (Dance Narrative) in depth. Playing with layers of TEXT/SUBTEXT/ SUPERTEXT, she explores forgiveness, loss, and the sometimes complex meaning of the said vs unsaid with help from four dancers and Daft Punk’s Doin it Right. ilvs strauss is an analytical chemist turned multi-disciplinary performance artist and theater tech living and making work in Seattle. Her art ranges from Dance Narrative performance to anamorphic outdoor sculptures, illustrated storytelling (aka Slide Shows) to haiku poetry. As Technical Director / Lighting Designer she has worked for Pat Graney, KT Neihoff, Salt Horse, and Cherdonna, and is currently the TD at Velocity Dance Center. She also teaches workshops on writing, movement and performance. Her solo piece, Manifesto (last seen at Risk/Reward Festival 2014), now an evening length show), was listed in Dance Magazine’s BEST of 2014 list. Five dancers (ilvs included) are in matching pedestrian outfits: grey shirts, black pants, sneakers. A Voice Over narration (ilvs’s voice) plays throughout the piece – this is the TEXT. 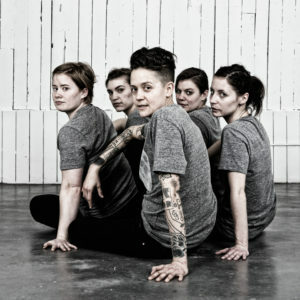 The dynamics of the performers onstage dance-interacting with each other and with the VO serve as the SUBTEXT – highly scored, improv-based movement. The movement is derived and inspired by words, with partiality paid to subtlety, facial expressions, and repetition. The final layer, the SUPERTEXT, is set unison choreography to Daft Punk’s Doin it Right that plays repeatedly and intermittently throughout the piece. In addition to Daft Punk, there is an instrumental sound scape of looped clips from songs off of PJ Harvey’s album Stories from the City, Stories from the Sea. As it stands, the story is about loss, sunshine, and saying goodbye. This entry was posted in 2016, 2016 Risk/Reward Festival, Risk/Reward Festival by Katie Watkins. Bookmark the permalink.